There are many cascades and pools along the trail and an old dam/mill site about 0.1 mile beyond the power line. The Kidder Brook Trail (red on the map) leaves the parking area at the Kidder Brook bridge on Twin Lake Villa Road in Springfield. It crosses the stone bridge and ascends along Kidder Brook to the SRKG Trail 5 (green on the map). This trail provides access to the Greenway. 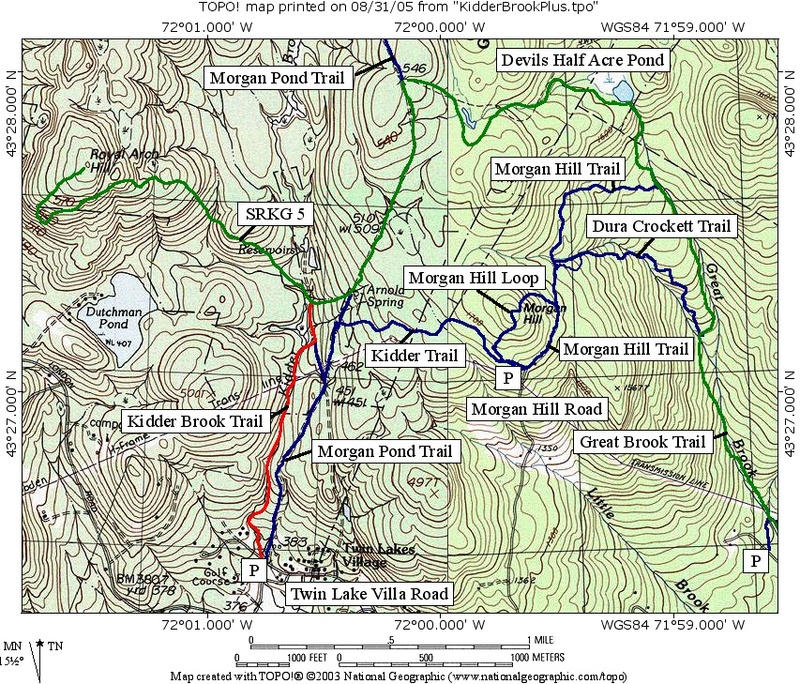 When combined with the lower section of the Morgan Pond Trail, the Kidder Brook Trail provides a 2 mile loop walk back to Kidder Brook bridge. The elevation profile shows the trail ascends 230 feet in just over a mile.